VMwareExpress truck came to VMware headquarter before noon today, parking between the gym and office buildings. I went to check it out this afternoon, also enjoyed ice cream in front of the truck. The following is a picture of the truck. I could use others, but think this one is better because it has the cloud as background. 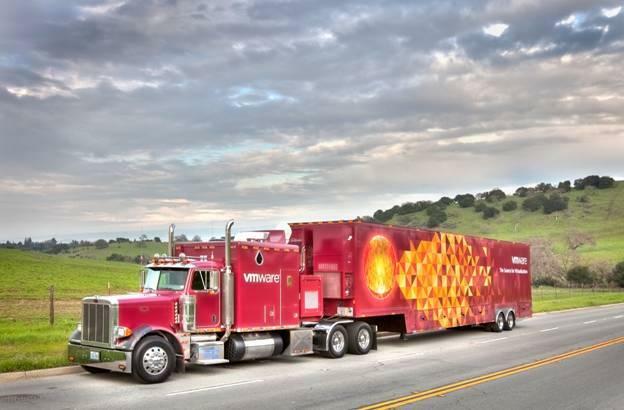 As you can see from the picture, the truck has bright colors with a slogan saying “VMware – the source for virtualization.” On the right side, there are two big screen showing slides. Internally the truck body is divided into three parts. The front is a small meeting room; the middle is a demo room for desktop and vSphere products; the rear part is a very small server room behind glasses. Besides the vSphere demos, there are desktop demos like FollowMe desktop that are very useful in hospitals where users move around frequently. You just wave your badge in front a reader to get your desktop and wave again to sign off. Whatever you left as last sign off is what you see at next computer. Great use case for the virtual desktops! The truck will leave for the 2010 Virtualization Tour. Don’t miss the opportunity to check it out when it goes close to you.